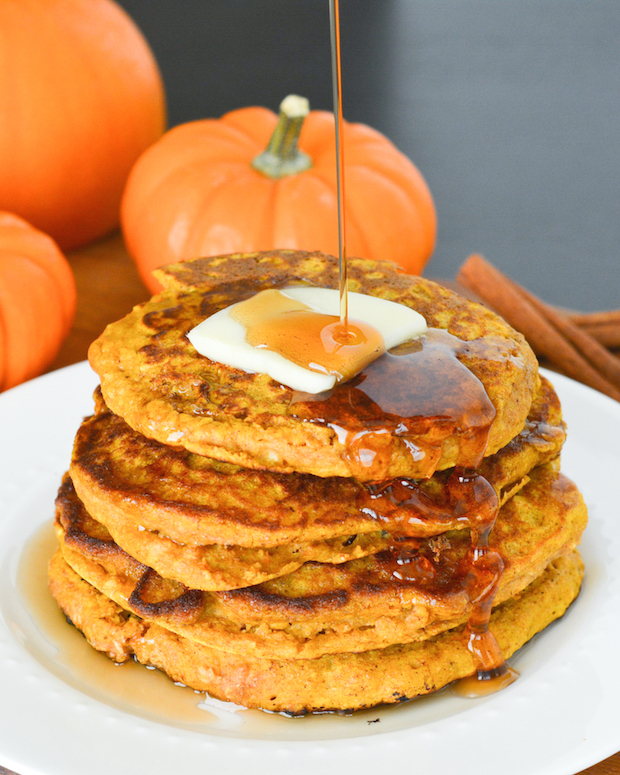 These hearty pancakes are packed with pumpkin, oatmeal and whole wheat. They’ll keep you full throughout these chilly fall mornings! Oh hey! Hey! I didn’t drop off the face of the earth! I just dropped out of the country… temporarily. Yep, my sad, empty, recently renewed passport got it’s first stamp. And I checked another continent off my list. South America! Yep, I spent last week exploring Chile and it was pretty amazing. The menfolk got to visit Chile for a few days for work, and a few of their wives and I decided we weren’t going to let this opportunity pass us by. When would we ever have another reason to visit South America? So we set out on a girls trip to Chile and met the hubbies halfway through our travels. It was the perfect combination of hanging out with the girls, solo time with the hubs, and fun adventures with great friends. I seriously think it’s the best vacation I’ve ever been on! Not to mention the fact that Chile was just amazing and beautiful, and we did so many different things. I’ll definitely be putting together a full recap for you soon! In the meantime, I’m trying to catch up with blogging, laundry, and furbaby loves. Well I’m pretty dang American, so when I got back I was ready for some pumpkin spice. In order to set myself up for a successful week I decided to make a huge batch of pancakes that I could reheat (just pop them in the toaster!) for breakfast every day. 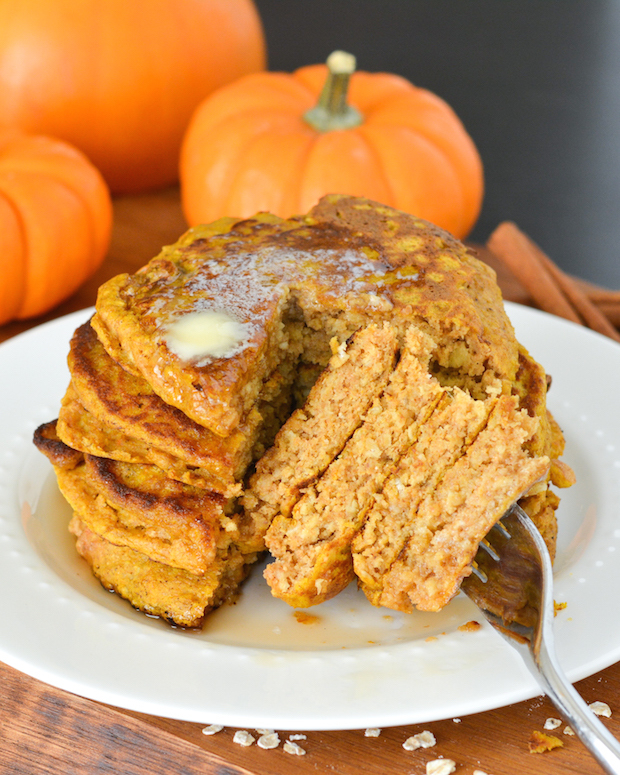 Pancakes are one of my favorite breakfasts and pumpkin just makes them all the better. I added some oatmeal into this batch to really give them some staying power! And a little extra baking powder makes them super thick and fluffy. What pancake dreams are made of. I’ve been chowing on these all week and I’m still loving the fall flavor. Pumpkin takes dessert next!? In a large bowl, beat together eggs, pumpkin, milk, brown sugar and vanilla until smooth. Add remaining ingredients and mix until no lumps remain. Heat a large skillet over medium-high heat. Melt a pat of butter in the pan, then pour a small ladle-full of batter into pan. Cook until edges are browned, about 2-3 minutes, then flip pancake and cook until cooked through, about another 2-3 minutes. Serve topped with butter and lots of pure maple syrup! Yum!! These look wonderful! I love the addition of oats! Pinned! Your trips sound super fun :). How fun! Chile is on my bucket list…we made it to Brazil and Argentina but South America is too big to see all at once! Love the looks of your pancakes, I bet your house smelled amazing when you were cooking them up! Oooh how awesome! Now that I’ve had a taste, I definitely want to explore more of South America! I can’t wait to read all about your trip Jess! So glad you had a great time. These pancakes look perrrrfect – I love the tip of reheating in the toaster for a quicker weekday breakfast! Yes! That’s my favorite thing to do. I’ll freeze a whole batch and reheat them the same way from frozen, too. Like toasted waffles! Chile! How exciting! I’m all about the pumpkin too and wait all year for the PSL to come. I’ve never had oatmeal in my pancakes or reheated them in a toaster. I love both of these ideas! Chile must’ve been wonderful! Welcome back, and thanks for bringing us pancakes! 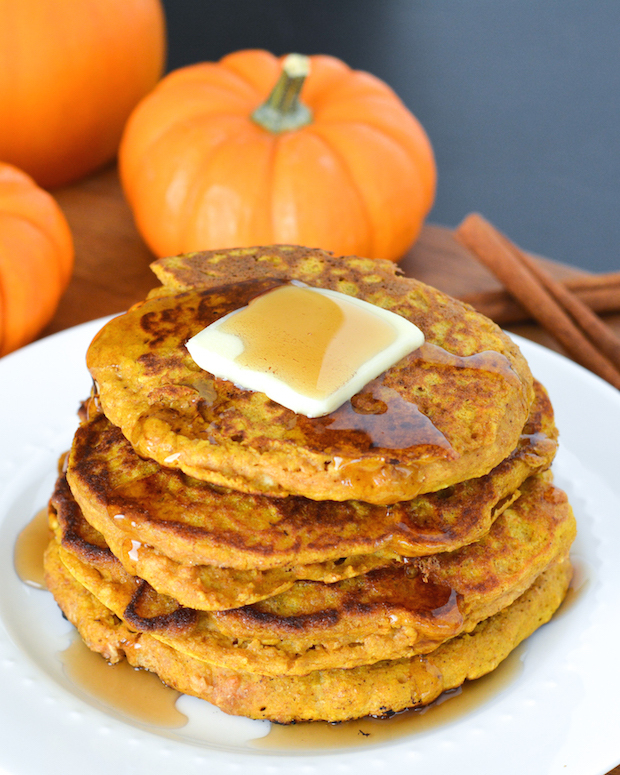 These look SO hearty and delicious! Thanks, Marcie!! They were sooo yummy! Those pancakes look so fluffy and wonderful. 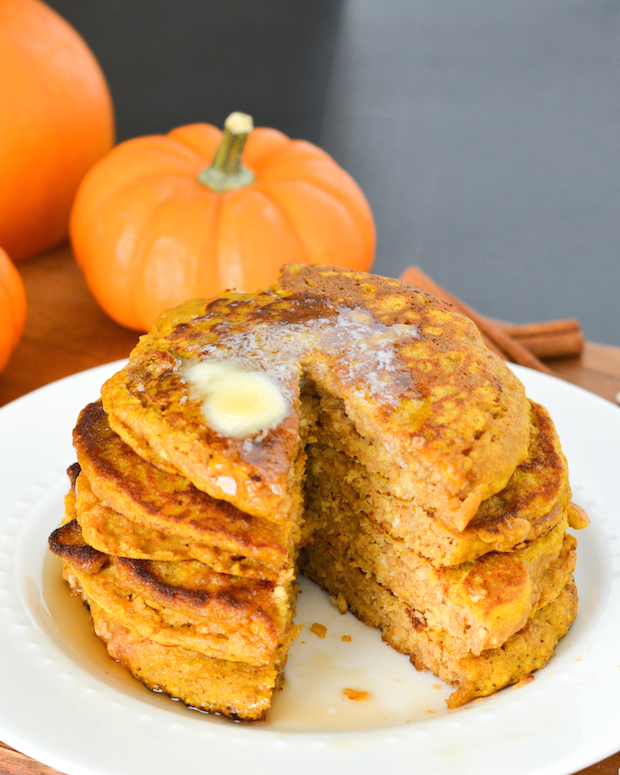 I’m totally obsessed with pumpkin, but I haven’t made pumpkin pancakes yet this year – need to do that! Glad you had a great vacation!